This is my Santa-Rita Prickly Pear that I purchased this weekend at Barton Springs Nursery; I went on a mission to find one, and BSN graciously supplied a beautiful selection to choose from. I wuv it! The color combo is stellar. I like that it is cold-hardy and will get more purple when it’s chilly or thirsty, so I assume when it’s stressed in general. I saw a very purple one in someone’s “hell strip” near 45th Street – should I leave them a note to water it? I want Ms. Rita to go some place special in my Purple Haze entry garden; I’d prefer to only plant her once, that is, not change my mind and move her (unlikely)…so I’m still considering the location- she becomes quiet statuesque, maybe over six feet, but I’ll keep her pruned lower probably- which means baby ‘ritas to share in the future : ) Maybe I’ll re-pot it in a contrasting colored pot (like red or yellow), so I can get her out of that hideous plastic outfit – she’s too good; that way we’re all happy, and my fear of commitment is fed. You might notice her boo-boo on the bottom right; I was driving down the fast and winding 2222, and Ms. Rita catapulted from my hatchback into the backseat. I don’t think I was speeding, Officer….but what if she had whacked me in the back of the head? You can see some spines on this lovely, but you can’t see the thousands (I swear) hair-thin (read invisible) spines that ended up in my dry-cleaning, back-seat and then my hands…but none made it to the back of my head- so thank you, universe – lesson learned. I still wuv her. 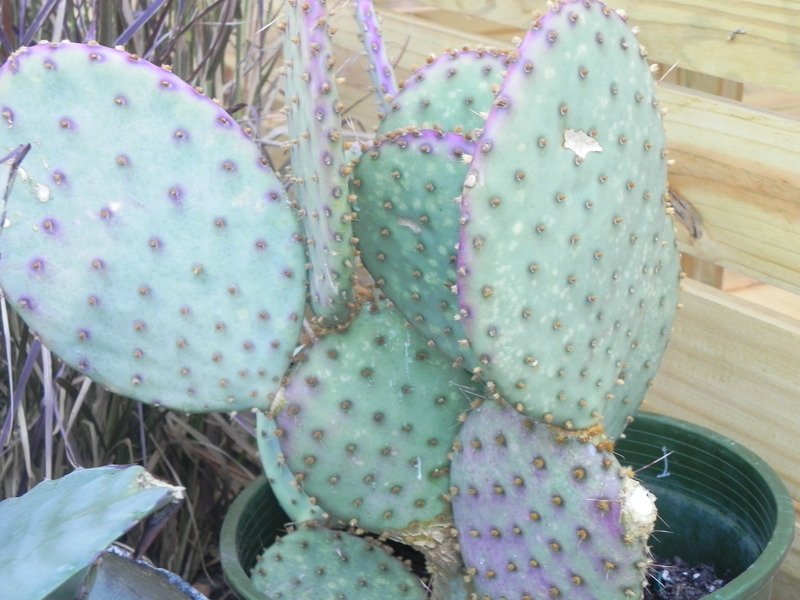 Helptul tip- to remove cactus spines from your skin, the ones you can’t get with tweezers- spread a thin layer of white / Elmer’s glue to the area, let dry, then peel away – worked for me! I read that hair-removal wax strips work well for the really stubborn ones, but I didn’t need to resort to that – so happy I didn’t have to wax the back of my head.